A new Bureau of Land Management (BLM) permitting station in Bluff, Utah, provides a strong conservation message to boaters in advance of any trip on the San Juan River. An alternative construction built with local soil, the 700-square-foot facility demonstrates how collaboration and attention to community and economy can successfully conserve resources. 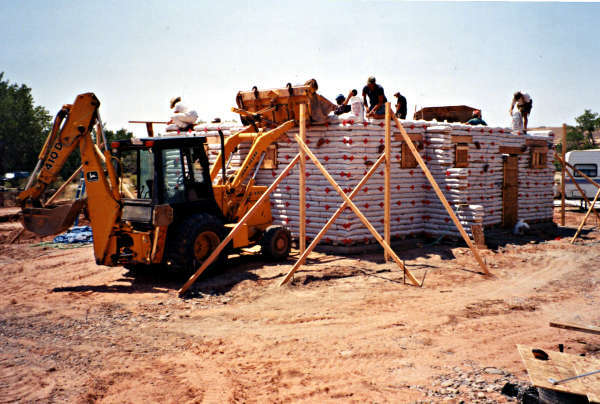 Termed flexible-form rammed earth, superadobe, or earthbag, the construction technique was pioneered by Iranian architect Nader Kahlili, whose buildings surpassed current standards for load capacity and earthquake resistance when tested at an experimental site in California. 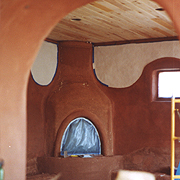 Natural earth plaster detailed with colors from locally harvested clay makes the inside of the building just as compatible with the environment as the outside of the structure. Bureau of Land Management civil engineer John Lewis chose this type of construction for several reasons. Bluff is a remote community just north of Monument Valley where traditional materials must be shipped from communities several hours away. Earthen construction allowed for the use of inexpensive local materials. Walls ranging from 15 to 24 inches in thickness create a thermal mass, which produces a soundproof and energy-efficient structure. Earthbag buildings are resistant to fire, flood, and rot, making them permanent structures that are less expensive to insure. Earthbag construction technology uses simple methods and few resources. 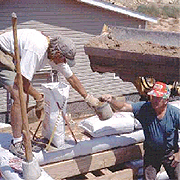 Polypropylene feed sacks are filled with dirt and compressed by tamping them with long-handled, homemade cement tampers. The sacks are misprinted bags (considered rejects) that can be purchased at a low cost. Earthbags are laid with two strands of four-pronged barbed wire between each course as in masonry. The wire provides tensile strength and keeps the bags from slipping. Ideally, structures are sunken three to four feet into the ground, and dirt excavated from the site is used to fill the bags. Soil used for the permitting station originated at a gravel yard about one mile from the site and was donated to the BLM. Building dirt was comprised of sand with 10 percent clay content. Other suitable soils are sand, stabilized sand, or crushed limestone. Lewis recruited a construction crew of five BLM employees with no previous earthbag construction experience, one National Park Service employee on interdivisional training, and two skilled earthbag builders contracted from Moab, Utah. The crew was instructed on site by the Moab team and aided by the NPS trainee, who possessed some previous experience in earthbag construction. Wooden forms were placed to establish openings for doorways and windows. Nails were shot into a concrete pad next, and sacks of QUICKRETE® were placed on the nails to bond the bags with the pad. The QUICKRETE® sacks were then perforated and watered to set up the concrete. This produced a 5-inch concrete stemwall atop the pad. Barbed wire was then laid on top of the concrete sacks, and the first row of earthbags followed. After a full row of bags was laid, the soil-filled sacks were tamped, compressing 10-inch bags into 5-inch bags. A rod welded to a steel plate and bolted through the front framewall joined the bag wall to the front of the building. 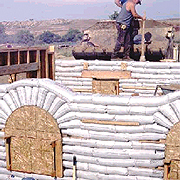 Earthbags are placed over arched wooden forms to create doorways and windows using the familiar keystone technique. This flexible-form construction refers to the ability to create circles, curves, domes, and other nonlinear shapes. Nailing plates were set between bags where door or window frames would be added. These consisted of short two-by-fours nailed to oriented strand board (OSB), and secured with nails to the bag. Nailing plates were also used to fasten electrical boxes in the wall system. Longer plates were placed higher in the walls for pictures to be hung in the finished building. Electrical conduit was installed between bags. 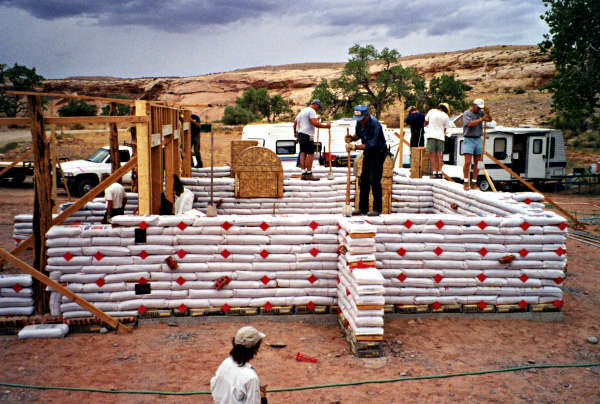 In only 80 hours, the small crew constructed 132 linear feet of 9.5-foot-high earthbag wall. A 6-inch cement bond beam was later poured on the top row of bags, raising the wall height to 10 feet. 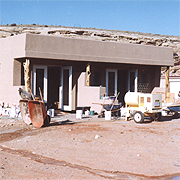 The finished building includes a pueblo-style roof and an interior featuring natural earth plaster detailed with colors from locally harvested clays. The exterior is sheeted with OSB board (secured by plastic fasteners inserted between the bags) and 2-inch foam finished with a synthetic plaster. Traditional cement stucco provided the slightly irregular appearance of an old adobe building.